The printer is a Hewlett-Packard OfficeJet 6500 WiFi model (related, you can force other printers to be AirPrint compatible), and not pictured is a MacBook Air 11″ used for travel. 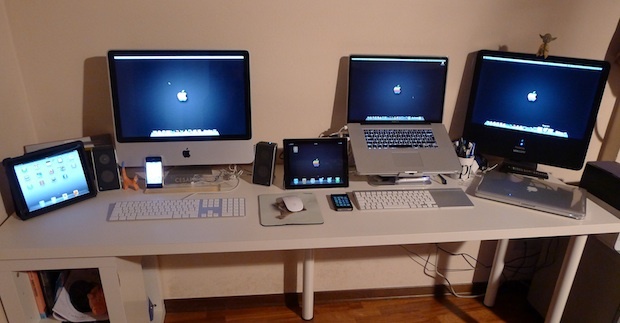 Want your Mac setup featured? Send pictures of Apple & Mac setups to osxdailycom@gmail.com and include some brief hardware details and what you use it for. Hahaha I had the same Apple mug! It’s got the rainbow logo on the side, no idea where I put it but they fetch a hefty sum on eBay. I’ve bought that mug during my first vacation in USA in 1988… I was at that time a student at Milan University (Computer Science Degree) and I went to the Apple HQ in Cupertino to visit it. Either the first iPhone (listed after the iPad 1) is a 4s, or it’s not 64gb. There was never a 64gb iPhone 4 (only 32gb or 16gb). I remember clearly because my extensive music library was the reason I waited until the release of the 4s (which finally has a 64gb option) to buy my first iPhone. You’re right, my “cut&paste” error: it’s a iPhone 4 32 GB..
Hey! Where’s the Air 11″?!? Hey, iPhone 4, 64Gb. Right??? I guarantee that is not a mid 2007 17″ MacBook Pro. The unibody models were started 15″ only in late 08 and early 09 for unibody 17″. another “typo-error”: it’s a Mid-2009… sorry..